Passion flower is a kind of new beverage fruit and it integrates the flavors of more than 10 fruits, such as bananas, pineapples, lichee, and strawberries into one, and is praised as "fruit with a 100 flavors" by the Taiwanese. People in overseas call it "king of all syrups". The syrups processed from passion flower has a strong aroma, and is a salable and high-rank beverage on both the Chinese and foreign markets. Passion flower is a kind of evergreen vine plant. It originates from Brazil and Paraguay of South America; and it now widely scatters in tropical and sub-tropical districts of the world. Passion flower is full of treasures. Its vines are long, its flowers are big, its canopy is peculiar and its color is quite bright. It has good yields and the fruits could group in heaps. 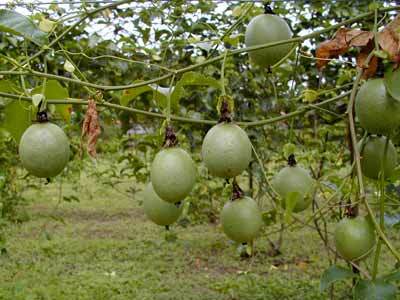 The shape of its fruits is like an egg, its juice is like yolk, thus it gets its Chinese name, "the egg fruit". The flowers and fruits of passion flower are all very beautiful and it is an ideal ornamental plant in the yard. According to tests carried out by experts, passion flower has more than 165 kinds of compounds such as protein, fat, sugar, vitamins, and iron etc, and 17 amino acids; it has very high nutritious values; its vitamin content is VC1345 (1�U/100G),which is an effect element for fighting cancer; its Niacin content is 1.7MG/100G, which plays an active role in preventing cardiovascular illness. After the ripening of the fruit, passion flower has a very strong aroma; when it is cut open, the aroma would give off all around; within the fruit, there are large amount of pulps and juices, which is tasty, refreshing and anti-thirsty; so, the fruit is particularly suitable for processing juice, syrup, and jelly. For the time being, the syrup produced in Xishuangbanna is sold very well. The seeds of passion flower has an oil content rate of 21.7% to 25.25%, and its oil quality is as good as that of the sunflower seeds; therefore, it is a superb edible oil. The roots, stalks and leaves of passion flower are medicines and have effects in diminishing inflammation, circulating blood and reducing blood pressure. Besides, its skin could be made into very good drinks too.